The trend toward school choice has educators across the country looking at Chicago’s Noble Charter Schools — an award-winning network of mostly high schools that specializes in helping inner-city kids achieve the kind of SAT scores that propel them into four-year universities. 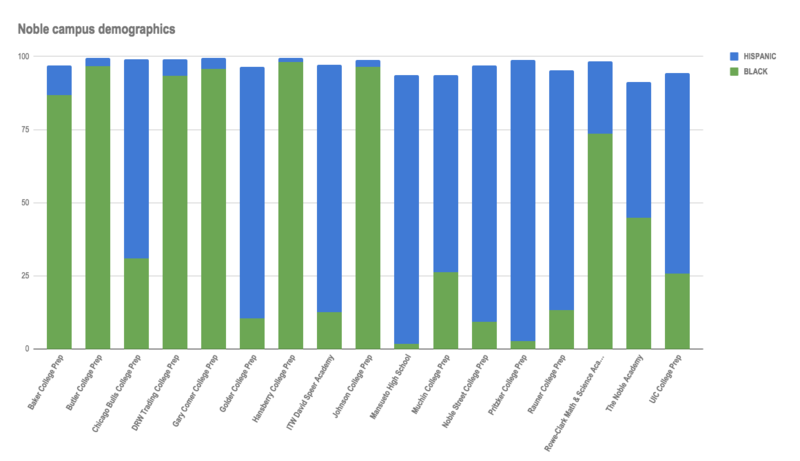 But despite its prestigious reputation, Noble has a peculiarly high teacher turnover rate. Noble’s handbook lists more than 20 behaviors that can elicit demerits. The dress code, for example, requires students to wear light khakis, plain black leather belts, black leather dress shoes, and school-branded polo-style shirts that must be tucked in. Hair must be only a “natural” color, and students can't have any designs in their hair. 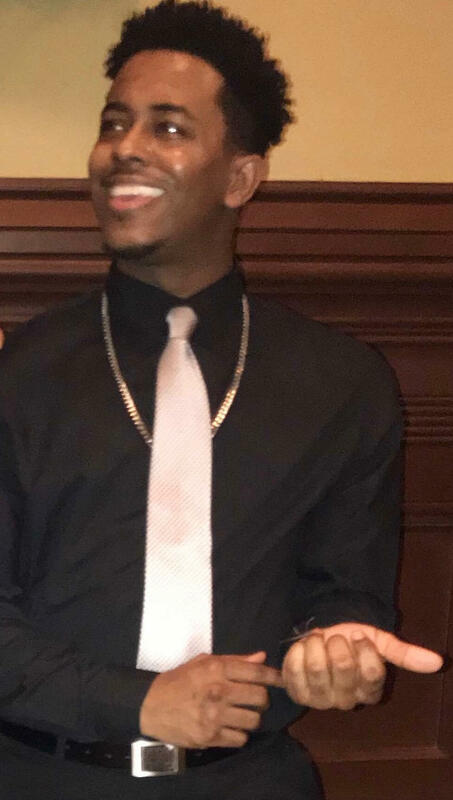 Kerease Epps, who taught at Noble’s Hansberry College Prep, made sure to arrive by seven o’clock every day to help students with curved lines in their hair avoid punishment. 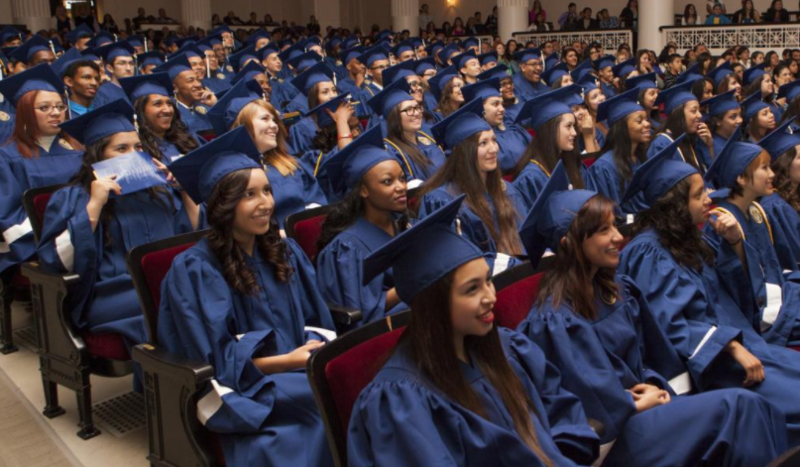 Chicago’s Noble Charter Schools — an award-winning network of mostly high schools that specializes in helping inner-city kids achieve the kind of SAT scores that propel them into four-year universities has a peculiarly high teacher turnover rate. And some of those teachers are speaking up about policies they describe as “dehumanizing." Ann Baltzer taught chemistry at Hansberry. 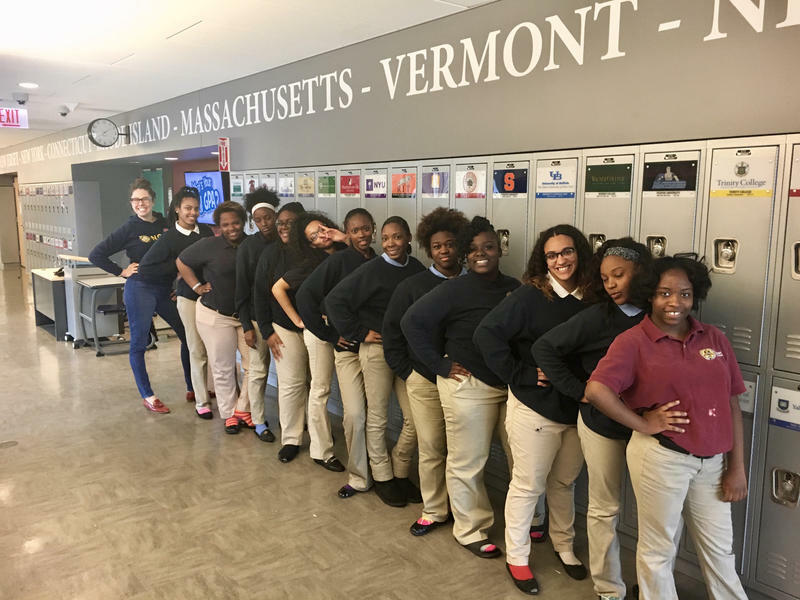 When one of her female students showed up with braids that included strands of maroon — the school color — the girl was told she couldn’t attend class. So she asked Baltzer to use a black marker to obliterate the maroon in each braid. The teacher looks back on that as not only unnecessary, but racist. “To have a system that results in a white woman having to color on a black woman’s hair, and if I don’t, she’s excluded from education, there’s something wrong with that,” Baltzer says. 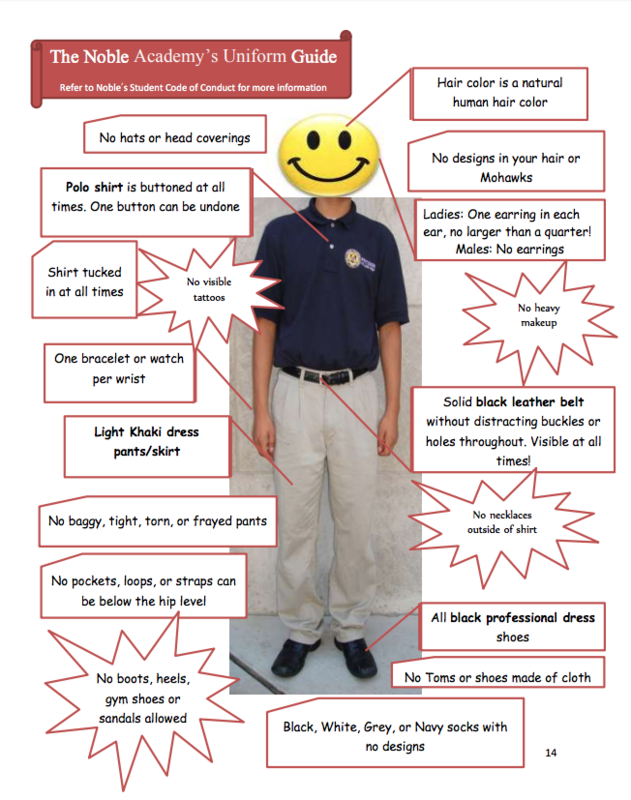 Each Noble Network campus can add requirements to the basic dress code. Here's a page from The Noble Academy's student handbook. But some teachers embrace Noble’s policies. Annie Bell was fresh out of college when she became the chemistry teacher at Noble’s Johnson College Prep. ”If one of my students came to school with red hair, I would say, ‘You knew. You totally knew that you shouldn’t have red hair,’” she says. With no prior teaching experience, Bell didn’t question Noble’s policies. Bell, however, believes the rules are necessary to mold low-income students into college material. “I will say it’s easy to question one piece, but when I look at the system as a whole, I really think it needs all the pieces to accomplish what we accomplished,” she says. Bell and Baltzer both left Noble after four years. That’s not unusual. Five Noble campuses lost at least half of their teachers over the past four years. Part of that is due to burnout: The charter network requires teachers to work longer hours, and often on weekends. But some, like Baltzer, cite Noble’s “culture” as the main reason they left. The network uses the word “culture” as a synonym for discipline. 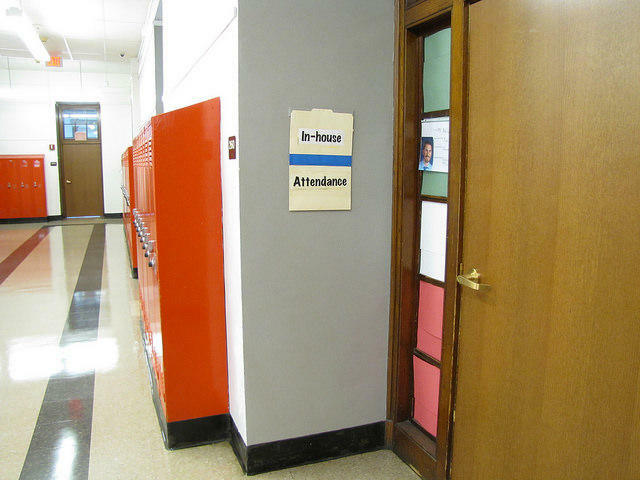 For example, each campus has staff members tasked with enforcing rules in common spaces (hallways, the lunch room, etc.). On some campuses, they’re called “disciplinarians,” but network administrators call them “culture teams.” Noble has two full-time auditors who drop in to observe classrooms on every campus to ensure teachers are upholding the culture. Baltzer and other teachers say they received professional demerits (sometimes called “mulligans” or YBTTs, short for “you’re better than this”) if an auditor found they weren’t issuing demerits for each infraction of Noble’s rules. For students, demerits can be costly. Any four demerits (such as failure to wear a black belt) within a two-week period triggers an automatic 2-3 hour detention. Students who rack up 13 or more detentions during a school year have to attend “character development” class at a cost, until this year, of $140. Students who get 26 detentions have to attend two character development classes. Students who receive more than 36 detentions in a year are automatically ineligible for promotion to the next grade. Consequently, a significant percentage of students opt to transfer out of Noble rather than repeat a grade. Data obtained from Noble Network through the Freedom of Information Act shows that, over the past five years, the general arc bends up, toward increasing numbers of demerits. Last year, the average number of demerits per student at Hansberry College Prep was more than 222, the highest of any Noble campus. “It’s a completely dehumanizing system, both for teachers and students,” Baltzer says. Deshawn Armstrong, who graduated from Hansberry in 2017, says level zero sometimes extended from passing period to the lunch period. Ellen Metz, principal of Noble’s flagship campus, Noble Street College Prep, says the network’s guiding concept is that rules are grounded in purpose, rather than power. Some parents are happy with Noble. 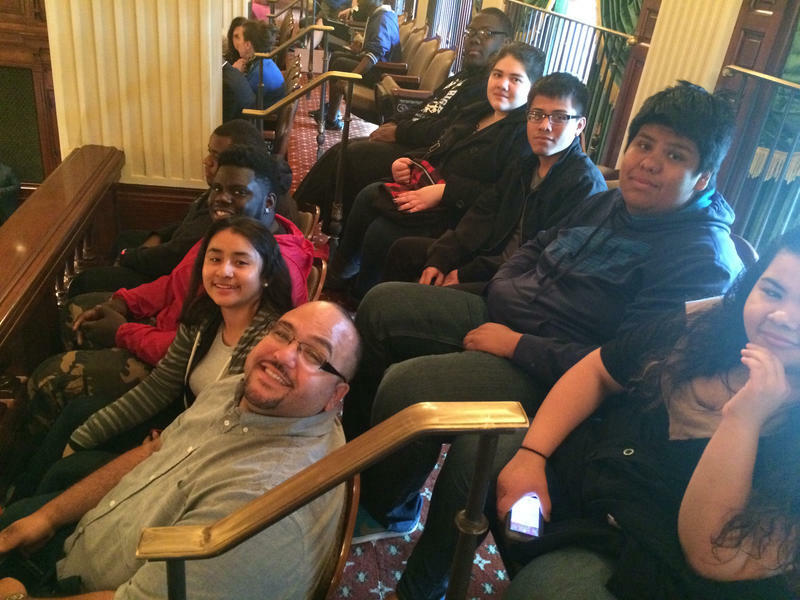 We spoke with one mom who even traveled to the state capitol with Noble’s lobbyist to tell lawmakers how much her daughter enjoys being a sophomore at Noble’s newest campus, Mansueto College Prep. Her daughter has a disability that qualifies her for an Individualized Education Program, or IEP, that includes a social worker on her support team at school. The mom, who asked that her name not be used, says her daughter has never received a demerit, and is on the honor roll. “She’s being challenged more at this school,” the mom says. Ellen Metz is principal of Noble Street College Prep, the school that launched the Noble Network of Charter Schools. 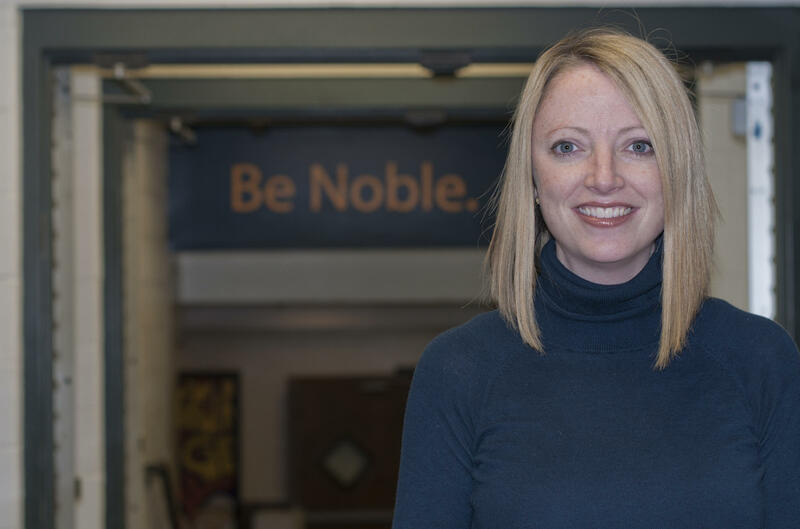 Jane Sundius, a social psychologist who focuses on poverty, children and education, says low-income families tend not to question systems like those at Noble. She points to a study by sociologist Melvin Kohn, exploring how parenting styles vary by social class. 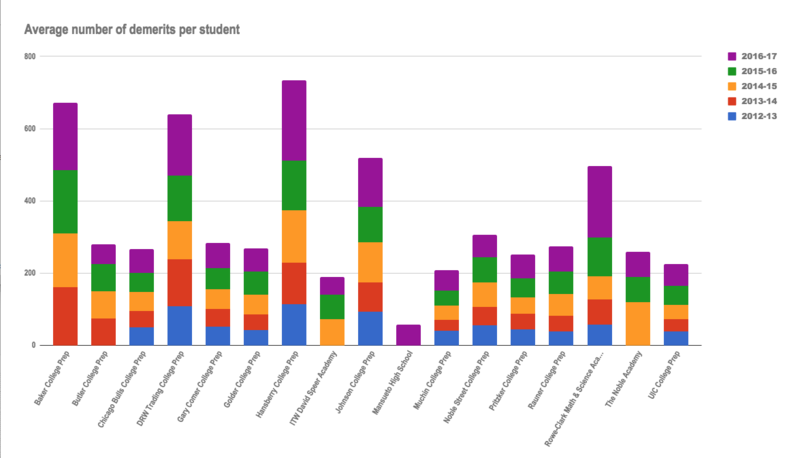 Discipline varies widely among Noble’s 17 schools, but data provided by the network shows students at five predominantly black Noble campuses (Hansberry, Johnson, Rowe-Clark Math & Science Academy, Baker College Prep and DRW Trading College Prep) last year got about twice the number of demerits as students at Noble’s 10 predominantly Hispanic schools. Two additional predominantly-Black campuses had lower demerit numbers, but they are different by design. One of them, Gary Comer College Prep, is housed in a newly-constructed building where every classroom has glass walls, to promote “transparency and accountability.” The other, Butler College Prep, is Noble’s “social justice” school, and most teachers and staff members are Black. Like many other charter networks, Noble hires many teachers through Teach For America. It’s a somewhat controversial Peace Corps-like organization that takes high-achieving university students, gives them an intensive, five-week course in education, and then dispatches them to teach in inner-city schools. Some turn this character-building experience into an eye-catching item on their resume as they transition into a wholly different career. However, whether they plan to stay in the field of education or not, TFA teachers tend to be young and inexperienced, but committed and compassionate toward their students. These attributes may contribute to Noble’s 40 percent turnover rate at the four-year mark. At Noble, each new teacher is assigned a 9th grade “advisory” — basically a homeroom of students they’ll see daily until graduation. They give these students their cell phone numbers, and answer calls or texts at all hours of the day and night. They become surrogate family members, and some get dubbed “Auntie” or “Uncle” by the students. Several teachers told me the reason they stayed at Noble was because they couldn’t imagine abandoning their advisees. Kerease Epps is still in touch with her advisees, but these days, mainly by phone. She came to Noble after teaching in Detroit schools, and never made peace with Noble’s discipline system. Like roughly one in five Noble teachers at Hansberry, and many Noble schools, she left after just one year. For her, it wasn't just the hairstyle code (in 2016, Noble actually relaxed the one-straight-line rule, even though it's still in the dress code for teachers); it was the bigger stuff. She saw the first red flag during Noble’s summer training session for new teachers. 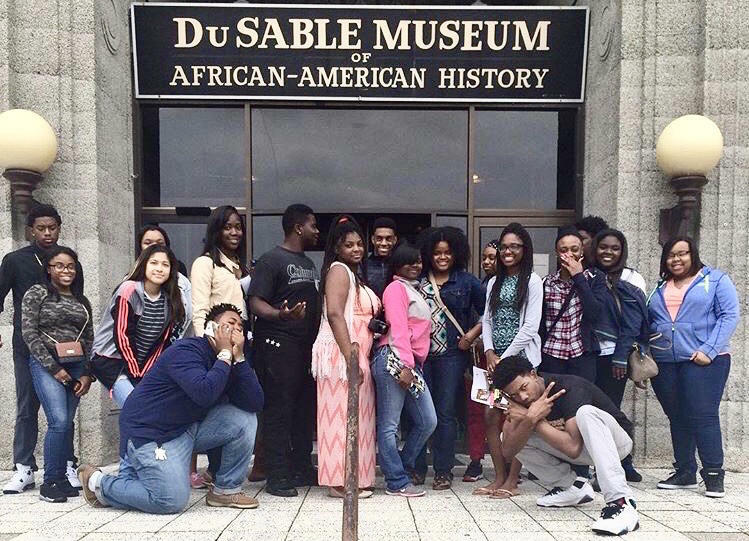 Kerease Epps (wearing glasses, a blue dress and gray sweater) took her African American History students on weekend field trips to museums. She left Noble after only one year, saying she felt "disaligned." 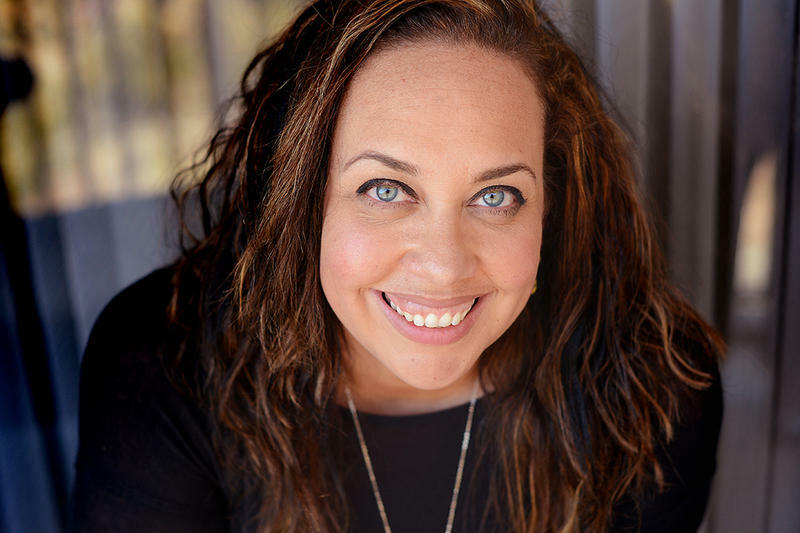 She relished getting to teach African-American History using a rigorous curriculum she designed herself, and spending weekends taking her students on field trips that got them special access to museums. But by the end of one year, she says, she felt so “disaligned” with Noble that she realized she had to leave. Epps now works as a public policy fellow for the Illinois State Board of Education. Baltzer is taking a year off teaching, but hopes to find a job with Chicago Public Schools. Bell is busy raising her two young children and taking graduate school classes to be a school counselor. Noble officials privately suggest that Baltzer and other former teachers are speaking out about discipline purely because charter school teachers are trying to unionize. And it’s true that Baltzer fully supports unionization efforts. She contributed an essay to “Why I Left Noble” — a blog founded by former Noble teacher Amethyst Phillips. The blog’s cover photo is a union logo. But Baltzer points out that she has nothing to gain from unionization efforts, having already resigned from Noble. “The reason I'm speaking out is simple: I cannot sit by silently as students I love and care about are treated this way by the public educational system,” she says. She recently applied for a job in another urban school district, and was alarmed that its administrators aspire to emulate Noble. In Illinois, Noble Network gets support from across the political spectrum. Both Gov. Bruce Rauner and the family of his Democratic rival, J.B. Pritzker, have donated enough money to Noble that they have schools named after them. Illinois Newsroom is a regional journalism collaborative (RJC) focused on expanding coverage of education, state politics, health, and the environment. The collaborative includes Illinois Public Media in Urbana, NPR Illinois in Springfield, WSIU in Carbondale, WVIK in the Quad Cities, Tri States Public Radio in Macomb, and Harvest Public Media. Funding comes from the stations and a grant from the Corporation for Public Broadcasting (CPB). Schools across Illinois are still waiting for state money while legislative leaders try to agree on a new funding formula. Governor Bruce Rauner vetoed large portions of a Democrat-sponsored plan, saying it was too generous to Chicago Public Schools. The list of educators lobbying for lawmakers to override that veto includes some surprising names. A plan awaiting Governor Bruce Rauner's signature would overhaul the way schools handle discipline. We wanted to meet some of the young activists behind the legislation. A law going into effect next month will ban zero-tolerance policies in schools and turn suspension and expulsion into disciplinary options of last resort. Districts throughout the state are taking different approaches to prepare for the changes. Kelly Wickham Hurst spent about 20 years with Springfield School District 186. As guidance dean, she frequently took to social media to share stories of black students being treated unfairly, and her efforts to advocate on their behalf. Sprinkled in among those stories were hints that some colleagues resented her, like the time a teacher inadvertently flashed a text message over the classroom projector and students saw Hurst referenced by a derogatory term. So it was no surprise when she parted ways with the school district and started an initiative called Being Black At School.